This was my seventh consecutive trip to Austin, Texas for the South By South West Interactive Conference—it may have been the best one yet. A plethora of things have changed since my first trip in 2006. The most obvious change is the attendance. In the past seven years, the attendance has nearly tripled. In 2012, Interactive had 24,569 attendees, up 27 perecent from 2011 (from Omar Gallaga, Austin360.com) There were nearly 4,000 interactive sessions planned. Typically the sessions are in the Austin Convention Center and the hotels right next door, but this year (and last actually), they were spread around the entire city. You had to take shuttles or grab a free ride in a Chevy, to make it to the venues. I've never seen the badge registration line as long as I have this year. It took a friend nearly 3 hours to get his badge. This same phenomenon was true for the official parties happening after hours around town also. As crazy as it sounds, this was still the best SXSW Interactive yet. Why? because I think I finally figured out how to deal with the large crowds and still have a fantastic trip—arrive one day early and pre-plan for smaller parties/events, go to sessions on a whim (or none at all) and generally relax and let the festival take you where it wants you to go. My friend Mike Rohde and I had a handful of smaller parties planned months before traveling to Austin for the conference. We had just enough pre-planned to keep us busy meeting some new faces and catching up with old friends. We flew down one day early and were able to register with no hassles, get into restaurants with no waits, and walk around town exploring the new gigs before the conference started. One can't visit Austin without sampling a variety of foods from BBQ to Tex-Mex, to the world's best cup of coffee (yeh, sorry Buddy the Elf, Austin may have it). 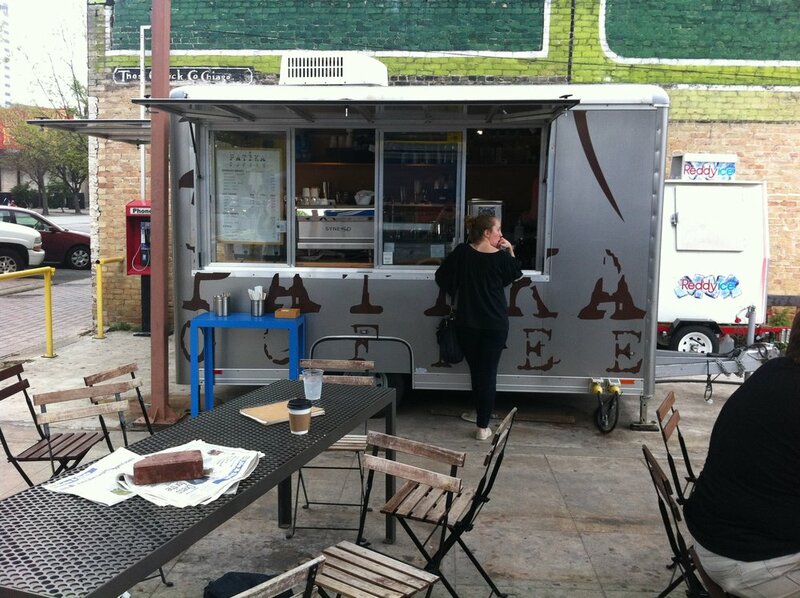 One of the first things we did when we arrived in Austin was take a walk to the Patika Coffee truck on Congress Avenue. I discovered their Mocha last year and I cannot find one to beat it. Its delicious. Hot or Cold. The crew that runs this truck is also very friendly. This is one of the best examples of a handcrafted, small business offering a quality product. Good coffee does make for happy people. Want a local experience? Find the Elephant Room on Congress Avenue and enjoy some of the best live jazz music around. Our friend Ove Klykken mentioned this place years ago and the experience was excellent. I'd say this is a great place to get away from the crowds during SXSW and just chill with a drink and good company while listening to some fabulous music. With over 4,000 sessions for Interactive this year, it was pretty hard to plan out which ones to attend. I glanced through the menu of sessions and really only had a handful I wanted to see. I think I made four or five total. This was an interesting panel discussion on request for proposals by a few individuals from large agencies to small. It was a pretty informative discussion, and in the end, left you asking; Are RFP's even worth replying too? The answer's were mixed; some failed RFP's led to bigger referral jobs, and some other RFP's were just fodder for the RFP giving company to use as a template for someone else. Check out Joe Rinaldi's slideshare from the panel. As co-owner of a Hybrid Ford Fusion, electric cars intrigue me. This solo session by Ben Holland discussed if we are ready for the electric car. Ben went through his slides about the cars, the grid, and other related topics to the car as it stands right now, but the most intriguing part to me was the discussion from a few audience members. One was from Denmark, the other from Austin, both Nissan Leaf owners. Hearing them talk about the experience and issues of owning this electric car was great insight. Take a listen to Ben's talk at the SXSW interactive site. This was only a fifteen minute talk by Hans Sprecher but it was solid. Hans covered responsive web design at its core and hopefully made people in the audience understand what it is about. Not an easy thing to do in fifteen minutes, but he presented very well. His Prezi on the topic explains his talk. This session was Austin Kleon interviewing Kirby Ferguson on the remix culture and how it seems almost everything is just a loose, or not so loose, mashup or mix of something done before. The talk was all over at times, but the video snippets from Kirby were pretty fascinating. His site, Everything is a Remix has very in depth videos on the subject. I wasn't sure what to expect from this one, but it was actually spot on with one of size43's offerings of web video storytelling. Lyn Graft's solo session was chock full of great advice on telling a business or an individual's story with video. Some of the bigger takeaways from the session were the ideal length of a video (2 minutes and 32 seconds) and that “storytelling is about making a permanent mark”. 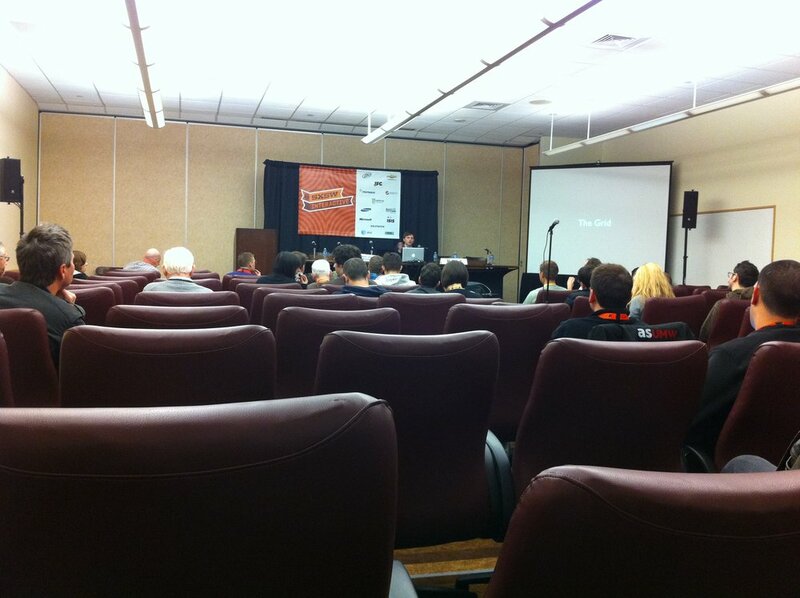 The SXSW website has the audio up for this session. Technically not a session, but definitely an awesome unofficial event, the MKEShindig was a blast. At the past two SXSW Interactives, myself, Mike Rohde and a small group of Milwaukee natives put on the Milwaukee Beer and Brat Bash. This year, a group led by Translator, Sosh, and Shindig with assistance from Mike Rohde and size43 helped put on a bigger bash with local Milwaukee bands, food, and flavor. People enjoyed lunch and walked towards the venue from blocks away after hearing live music from I'm not A Pilot and Fresh Cut Collective. Our goal was to spread the word that Milwaukee is doing awesome things. I attend this conference every year to be inspired, make new friends, catch up with old friends, and stay on top of my industry as a business owner. I cant think of any other conference, er, festival that combines these ingredients in the way SXSW does with Austin as the melting pot. Most of us can't wait to go on vacation to get away from our jobs, but I can't wait for SXSW Interactive every year to refuel my being, my inspiration and my job. I love what I do, and to be around tens of thousands of other souls with the same passions, in the middle of Texas, in the middle of March every year, is geek heaven. Does Austin have an honorary local badge?